COMMENTARY ON "DOES JOB FEAR GOD FOR NAUGHT"
This week’s lesson continues the Great Controversy theme through the intensifying attack on Job. Instead of moving systematically through the lesson, I will address some of the assumptions stated as fact in the lesson and the Teachers’ Comments. The underlying Adventist doctrine of the great controversy completely skews Adventists’ dealing with the book of Job as well as with the rest of Scripture. First, the idea that there is a public controversy in which Satan has made public accusation against God’s character and law—an accusation which must be answered by obedient creatures serving God out of free will choices to love Him and thus proving that He is absolutely fair—is simply not biblical. To be sure, God did vindicate Himself to the universe, but not because Satan had accused Him of unfairness. The great controversy model presents a powerful devil who credibly accuses God of being unfair in His demands on creatures and, as in the book of Job, essentially bribing them to serve Him by blessing them. Then what becomes of our boasting? It is excluded. By what kind of law? By a law of works? No, but by the law of faith. For we hold that one is justified by faith apart from works of the law. Or is God the God of Jews only? Is he not the God of Gentiles also? Yes, of Gentiles also, since God is one—who will justify the circumcised by faith and the uncircumcised through faith (Romans 3:21-30). Adventism builds its entire foundation upon a straw-man argument. There is no universal questions about god’s fairness. Moreover, the universal question that existed was how He could leave sinful man alive on earth? The cross was the final answer to God’s justice in not punishing the sins committed before the Lord Jesus came as our Sacrifice and Substitute. Now that Jesus has died and risen again, the universe has NO questions about God’s justice or man’s rightful place. It is clear: those who do not believe in Jesus remain dead in sin (Eph. 2:1-3) and bound in the domain of darkness, subject to the prince of the power of the air. Those who believe are transferred out of the domain of darkness (Col 1:13) and pass into eternal life at the moment they believe (Jn. 5:24). There is no “great controversy”. The assumption underlying the entire lesson series is wrong. “There is an interesting ambiguity at the beginning of the three angels’ messages in Revelation 14:7. The ‘hour of His judgment’ could refer to the judgment that God is enacting as a Judge, but also to Hi being judged. It appears to be an intentional ambiguity, given that both meanings have an important theological message. While God is certainly the Judge who presides over the final judgment both in its investigative (1844) and executive (second coming of Christ, millennium, and destruction of evil) stages, He also has made Himself transparent to the scrutiny of the universe, with both the great controversy and the plan of salvation being, collectively, a spectacle to the world and to angels. The whole universe will acknowledge Him as a God of love and justice, exactly the two characteristics that Satan has tried to distort." And I heard a voice from heaven saying, “Write this: Blessed are the dead who die in the Lord from now on.” “Blessed indeed,” says the Spirit, “that they may rest from their labors, for their deeds follow them!” (Revelation 14:6-13). You will say to me then, “Why does he still find fault? For who can resist his will?” But who are you, O man, to answer back to God? Will what is molded say to its molder, “Why have you made me like this?” Has the potter no right over the clay, to make out of the same lump one vessel for honorable use and another for dishonorable use? (Romans 9:19-21). God is not evaluated by His creatures. He is not judged, examined, or vindicated by us. Rather, He makes Himself known, and the cross has displayed His justice for eternity. Nothing began in heaven in 1844, and when God judges the earth, the issue will be over human belief and unbelief. Those who believe do not enter judgment; those who do not believe are judged already (Jn. 3:18). This lesson’s focus and its strained eisigesis of the book of Job is entirely the product of Ellen White and her great controversy. The Bible, however, presents Job not as an example of humanity caught in the crossfires of a battle between Christ and Satan but as a picture of a man who is faithful to God because he trusts Him and His word. 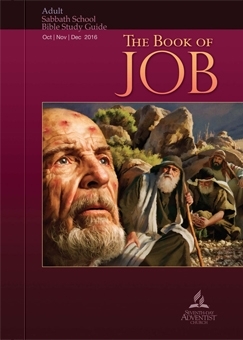 Moreover, the book of Job ended with righteous Job repenting for having believed he understood how God worked. Adventism stands in need of repentance for misrepresenting God, for exalting Satan to a position of importance and influence the Bible never grants him, and for teaching its members that they ultimately have the universal “last word” in exonerating the character of God. We do NOT help God. He rescues us with no cooperation from us, and He brings us to life when we believe in the Lord Jesus and His completed atonement on the cross and His resurrection from the curse of the law—death. Copyright 2016 BibleStudiesForAdventists.com. All rights reserved. Revised October 7, 2016. This website is published by Life Assurance Ministries, Camp Verde, Arizona, USA, the publisher of Proclamation! Magazine. Contact email: BibleStudiesForAdventists@gmail.com.